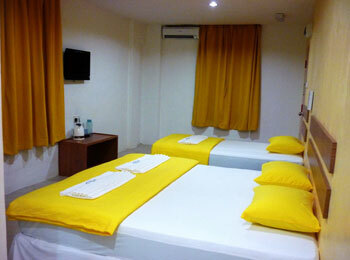 Sipadan Scuba is conveniently located right opposite the Hotel Holiday Dive Inn at the seafront in Semporna. Accommodation: Sipadan Scuba is located right opposite the Holiday Dive Inn where the majority of our divers chose to stay. The Holiday Dive Inn is a brand new, budget-style hotel that offers comfortable twin and triple rooms equipped with air-con, private bathroom, satTV, wifi, an upper-level open air lounge, and spacious dormitory rooms for backpackers. Best of all, you are located right at the center of the tourist area along the seafront with a wide choice of restaurants, bars, shops and banking facilities. After diving you may chill out at the adjacent D'Waterfront Bar overlooking the Semporna shoreline and islands while enjoying a cold beer and tasty snacks from it's western menu. .
Go to www.holidaydiveinn.com and book your room at the Holiday Dive Inn now with instant online confirmation. By airplane: Fly via Kuala Lumpur or Kota Kinabalu to Tawau. Our own air-con van can pick you up from the airport and bring you directly to our dive centre. Go to www.airasia.com or www.mas.com.my and check/ book your flights to Tawau online. Overland by coach: Take a bus from Kota Kinabalu or Sandakan directly to Semporna. Sipadan Scuba is just 5mins walking distance from the bus terminal, follow the road along the shore down to the waterfront.